This ongoing project started in 1982. 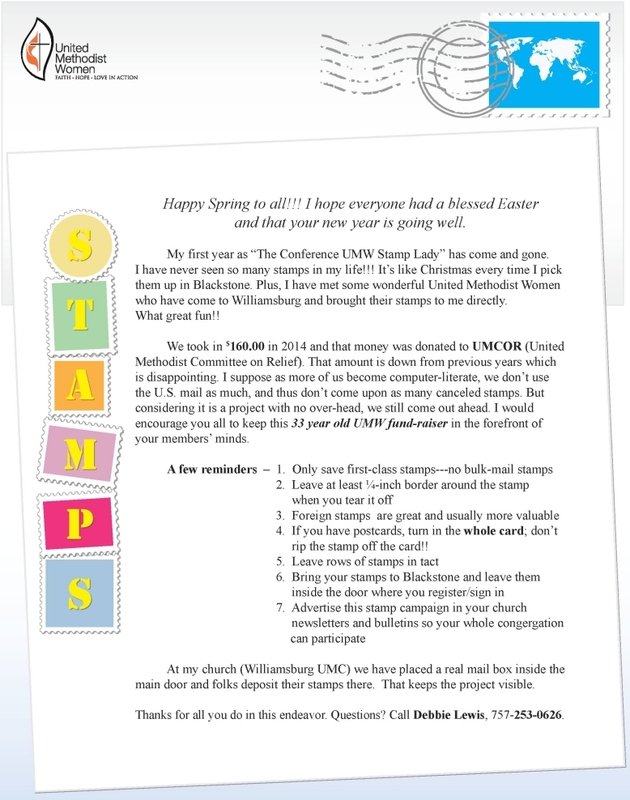 United Methodist Women have been faithful in bringing stamps to UMW events. They are sold to a York River District stamp collector and distributor. The receipts for stamp sales are sent to the Conference Treasurer for distribution through UMCOR. All canceled stamps (except bulk mail stamps) are accepted, foreign stamps are usually more valuable. Cut or tear at least ¼ inch border around the stamp. Do not peel it from the envelope. Leave rows of stamps intact . Place cut stamps in bag or envelope and bring to a UMW event, do not mail in. E-Mail has lowered the number of stamps we are receiving, very important you save all canceled stamps you receive, bag them and bring them to UMW events. It's amazing how much we can glean from just little pieces of paper that would otherwise be thrown into the garbage! You can make a difference with very little effort. Would you like to receive an email when the quarterly newsletter is published? Click here to join the mailing list, unsubscribe any time. Click the image above to download the latest newsletter! The Charter for Racial Justice Policies was written over sixteen years ago, yet the importance of working toward peace is still needed today. The Social Creed can be found in the back of the United Methodist Hymnal highlighting the need to be conscious of who and how to strive for peace. Each local unit can be a part of that peace as they challenge their members through this program, Living Into Our Purpose. Please send the completed form to our Education and Interpretation by August 31. The United Methodist Women Reading Program encourages women to read and educate themselves in the five areas of emphasis: Leadership Development, Education for Mission, Spiritual Growth, Social Action, and Nurturing for Community. The more we know, the more we grow! Your unit can receive a six star certificate by giving to the six areas of Undesignated giving. These gifts go to fund the mission program voted on by the Woman's Division. Having a Rainbow Giver in your unit covers 5 out of the 6!